When I first met Jose I realized he had a special ability to study the anatomy, habits and actions of fish, and would then adopt a technique to catch them. For example when he looked at a Tarpon he saw a fish with eyes and mouth turned upward. This told Jose a Tarpon likes to feed from the surface. In observing the Tarpons swimming actions he noted; while rolling to gulp air (Tarpon must supplement oxygen by gulping air). Jose observed that sometimes the Tarpon would kick off at the end of the roll. This told him that they were going down to the bottom. Other times the tarpon did not kick off from the surface. From observing these actions he knew to fish baits on the bottom or on the surface. I noted that during cold fronts most guides caught very few or no Bonefish. When water temp drop below 75 degrees on the flats Bonefish are non-existent. Jose would catch 10 to 15 Bonefish during these conditions. I asked how. He explained on the ocean side of the Keys the cold north wind would push the cold water over the flats and through the islands on the ocean side. On the lee side of the islands, pockets of warm water would be trapped. The Bonefish would congregate in these pockets of warm water and were easy prey. In another discussion we sat on the porch of my Cudjoe home and pondered why only a very few Yellowfin Tuna were caught off the Keys. Jose and I knew the Yellowfin Tuna were here in good numbers. I had observed them for years in large numbers. During winter they were in 140 ft. to 240 ft., and they would sometimes be mixed in with the Blackfin tuna. In the summer I observed them from 600 ft. to beyond the wall. We discussed different methods to try and catch them. We mutually agreed that live bait chumming with Pilchards and using light leaders and small hooks was the best method to catch them. I called Jose after observing a school of yellow fin near the Wilksbarrow Wreck in 240 ft. of water SW of American Shoal Light. These Yellowfin seldom responded to trolled baits. Jose sprang into action. He was the perfect person for this mission, skilled with a cast net to catch the Pilchards. His boat that he helped design, was outfitted with very large live wells. We knew that he would need to drift with his motor off. The next day Jose arrived with 2000 live pilchards and Shimano TLD-20s. He began chumming for the Yellowfins in the area of the wreck. 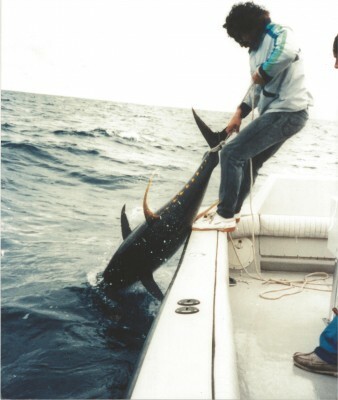 The first several drifts the Yellowfin tuna did not respond. Yellowfin tuna are very boat shy, and a boat trolling in the area may have kept them down. On the next drift Bonito came up, and then the Blackfin tunas joined the Bonito. The Yellowfin tunas began exploding all around the boat on the live chum. Jose quickly baited the hooks with live Pilchards and free lined them back into swirling mass of tunas. One thing we did not plan for was the size of Yellowfin. Now here is, Jose by himself, with two 200 pound plus Yellowfin tunas screaming off line in opposite directions. Long story short, Yellowfins spooled him. This was the beginning of a fishery that lasted over 15 years. 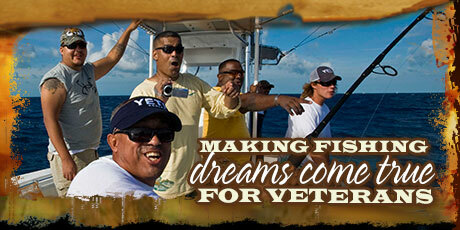 December and January were the best months for Yellowfin and over 250 were landed. Light tackle fishermen out of Key West later introduced live baits being fished from a kite for the Yellowfin tunas with great success. 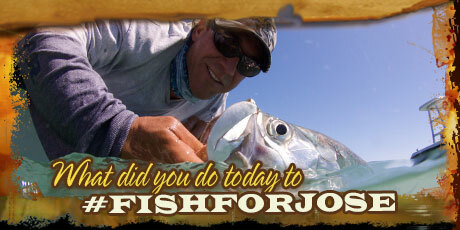 Jose later launched his world-class TV fishing show Spanish Fly with JM Associates and Mike McKinnis. Jose had a very special way about him. He was soft-spoken, extremely articulate. After spending 10 minutes with him you felt like you were best friends. He spent a lot of time and effort with kids that had life threatening diseases. He visited them in the hospital and took them fishing when they were well enough. 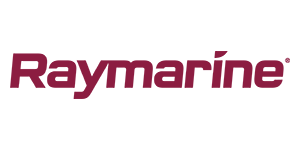 The Jose Wejebe Memorial Foundation carries on his legacy. 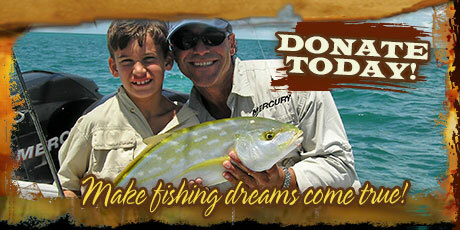 I considered Jose the sport-fishing ambassador of the Florida Keys. His soft spoken demeanor and articulate style of fishing was perfect to promote the world class fishing in the Florida Keys and its relaxed lifestyle of living. There will never be anyone to take his place, but his legacy lives on with the Jose Wejebe Spanish Fly Memorial Foundation.